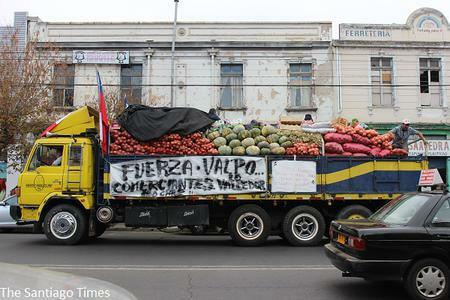 On May 24, a coalition of neighborhood groups, students, labor unions, and other civil society organizations convened a popular assembly in Valparaíso, the major Chilean port city devastated by a raging fire last month. 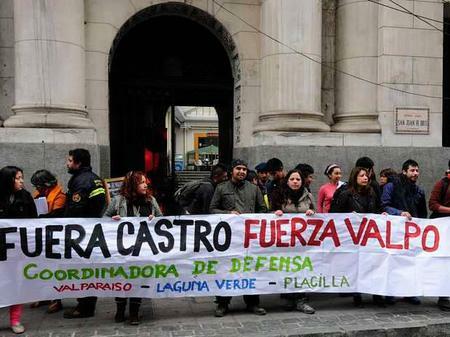 Announcing their aim to develop a grassroots plan for the recovery and reconstruction of Valparaíso, the Coordinadora for the Defense of Valparaíso also demanded a temporary freeze on construction permits and the resignation of right-wing mayor Jorge Castro. Valparaíso, April 12, 2014 (resumenlatinoamericano.org)“The destruction and abandonment of Valparaíso, of which this conflagration is an unfortunate result, has authors who must assume [responsibility for] the consequences of their reproachable acts and omissions,” the Coordinadora’s statement reads in part. The Coordinadora blames powerful political and economic interests for the “twin tragedies” of abandonment and real estate speculation that are destroying Valparaíso, and wants them to be held accountable. The April 12 fire—the worst in Valparaíso’s history—raged for 5 days, scorching more than four square miles of land on seven hillsides. The conflagration destroyed 3,000 houses, killed 15 people, and left 12,000 homeless. The city remained under military control for a month. Valparaíso, a UNESCO world heritage site, is famous for its unique topography and architecture, characterized by brightly painted, improvised wooden houses that climb the steep hillsides, forming a natural amphitheater that overlooks the port. It is a city of political contrasts, the birthplace of both Salvador Allende and Augusto Pinochet. Boasting a strong union base that provided a bastion of popular support for Allende, it is also the home of the Chilean navy, from which the 1973 military coup was launched. Today, Valparaíso is an increasingly popular elite tourist destination, as well as a focal point for Chile’s combative student movement. Economically, its population has one of the most unequal income distributions in Chile. Twenty-two percent of the city’s residents live below the poverty line, compared to a national average of 14%. Like most South American cities, Valparaíso’s development patterns reflect its rigid class divisions, with the wealthy occupying the coastal flatlands in the center and impoverished families spreading out over the heights on the northern and southern periphery. The areas most affected by the fire were poor hillside communities, settled by urban migrant families through a continuing process of land takeovers that has occurred since the early 1970s. Reportedly, Valparaíso—Chile's third largest metropolitan region—has the largest number of campamentos (informal settlements) in the country. According to a recent government survey of nine campamentos that were completely destroyed by the fire, 83% of the affected resident households are headed by women, most of whom work in the informal sector as street vendors or carton recyclers. Sixty percent of the population is under the age of 30. Many displaced families lack formal title to their land, potentially compromising their eligibility for government rehousing and rebuilding subsidies. As a result, they have chosen to remain camped out amidst the charred remnants of their homes rather than relocate to temporary government shelters and risk permanent eviction. Donations from local producers (Sandra Segall, Santiago Times). 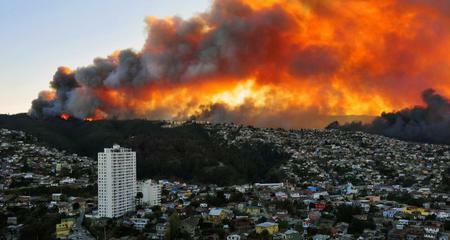 To be sure, fires—fanned by strong coastal summer winds and spreading quickly over difficult-to-access hillsides—have plagued Valparaíso throughout its history. In recent years, prolonged drought and unseasonably high temperatures associated with climate change have exacerbated the risks of these natural conditions. But, as Sebastián Gray, president of Chile’s College of Architects, notes, the recent fire also represents a colossal political failure of the state in terms of urban planning, design, infrastructure, public services, and regulation. “The fire is the result of a complete lack of [governmental] responsibility that has accumulated over the past 40 years, as the city has grown,” Gray charges. Apart from regularizing some land titles, according to Gray, the city has done little to address the problems caused by unregulated peripheral growth. It has not discouraged settlements in the most precarious zones, or redesigned narrow, winding hillside streets to accommodate emergency vehicles. It has abandoned the water supply system invented by Valaparaíso’s firefighters and municipal workers 100 years ago, which utilized a large hilltop reservoir for storage (the reservoir is finally now being renovated). The lack of working fire hydrants and water supply sources on the hilltops was a principal abetting cause of the fire. Mounting combustible garbage in the ravines, due to the city’s failure to provide adequate hillside trash collection services, also fueled the fire’s rapid spread. Valparaíso residents blame Mayor Castro for failing to protest when ex-president Sebastián Piñera cancelled national funding for a ravine cleanup program several years ago. According to Gray, over the years the Chilean state has increasingly abandoned its municipalities to fend for themselves, leading to extreme disparities in the level of services provided by rich and poor cities. Historically, despite its strategic importance as a port city, Valparaíso has been cash-strapped—in part because the port does not pay for its use of city services and the costs it imposes on the municipality. While ignoring the needs of Valparaíso’s poorest residents, the city’s political and economic elites have encouraged downtown redevelopment projects like the Barón Mall, a massive harbor-side shopping center with superstores and hotels now under construction by a private company on land acquired (cheaply) from the port. The national Housing Ministry is slated to provide more than $21 million in subsidies to the project. Although UNESCO recently warned that the development could jeopardize Valparaíso’s status as a world heritage site, both municipal and national authorities have vowed to proceed with it. Meanwhile, the government’s post-disaster response has been widely criticized as inadequate, disorganized, and delayed. Mayor Castro provoked his own political firestorm by responding to an irate fire victim, “Who invited you to live here?” At least one group of displaced residents has threatened to go on hunger strike in protest. Launching the Coordinadora (elrodriguista.org).In stark contrast to the failures of the state, Valparaíso’s fire victims have experienced an unprecedented outpouring of solidarity and support from civil society organizations. Thousands of volunteers have been mobilized by labor unions, community organizations, local soccer clubs, and, especially, student groups, to assist families with day-to-day survival, cleanup, and rebuilding activities. Communal cooking facilities (reminiscent of “Las Ollas Comunas”—the “common pot” soup kitchens from the dictatorship era) have been established in affected neighborhoods by youth and worker organizations, spawned by a social media campaign labeled “Una Cuadra, Una Cocina” (“one block, one kitchen”). Local agricultural suppliers have donated truckloads of produce. Students at three universities launched a “solidarity strike” to demand time away from classes for volunteer work. These community-led and self-managed relief efforts have proved to be much more successful than the state's formal disaster response. Similar to the links forged between Occupy activists and communities decimated by Hurricane Sandy, these alliances have now given rise to a nascent community-based reconstruction planning initiative. In both situations, daunting challenges and questions remain. Should residents be allowed (or entitled) to return and rebuild on precarious sites that pose a continuing environmental risk? Can a disparate grassroots coalition born of disaster maintain sufficient unity and political leverage to affect the outcome of a protracted reconstruction planning process? From New York City to Valparaíso, whether an urban catastrophe can become an opportunity for progressive change remains to be seen.